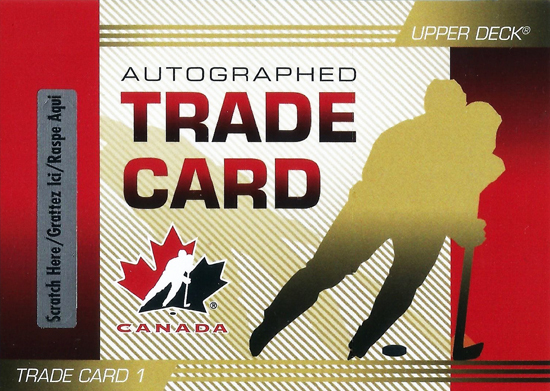 Upper Deck made a strong effort to include all live autograph cards in the company’s 2013 Team Canada Hockey product. There were no unplanned autograph redemptions in the product, but the company wanted to include two standout rookies from the recent draft class. The only way to make that happen however was to use “Trade Cards” redeemable for these players. Lucky customers who pulled these cards can register them online, by calling into Upper Deck or by mailing them in; though most seem to prefer entering them online at www.upperdeck.com. 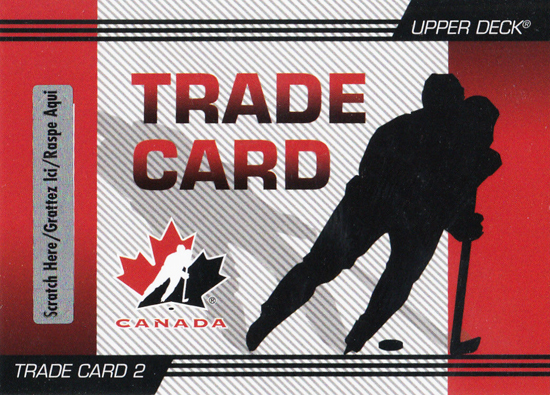 Regular Trade Cards fall at roughly one per case for the 2013 Upper Deck Team Canada Hockey product. The regular versions fall 1:288 packs at hobby and 1:2,880 at retail. There are also rare gold versions that are good for autograph parallels of these cards available only at hobby falling 1:1,440 packs. Upper Deck is in the process of getting these cards designed currently and they should be available in the Spring of 2014. We will provide more details as the production process nears completion. Autograph versions of the Trade Card are very difficult to pull and are available only in hobby packs. This card will be good for an autograph card of Nathan MacKinnon. The players featured on card TC-1 will be Nathan MacKinnon and on card TC-2 will be Sean Monahan.